Spring is nearly done and as we approach Summer, I thought this week I would spotlight Geranium, a floral oil. 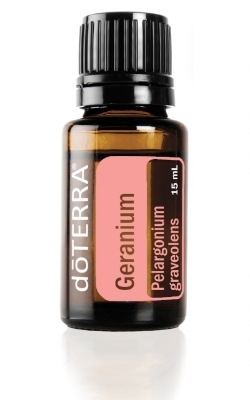 Geranium promotes youthful looking skin, hair and nails. This is how I use dōTERRA Geranium during my nightly routine to hydrate and promote healthy skin. Each morning I wake up and my face feels vibrant and youthful...I don't want to boast here...this is all the product I use, but I am often am mistaken for being much younger! Geranium has a sweet floral aroma and is even used in desserts, sweets, teas, and pastries. It is also known to assist in calming nerves and lessening stress. Another cool thing is that Citronellol, which is one of the components in Geranium, acts as a natural insect repellent and it comes in real handy during spring due with the increased insect activity.